CAD/JPY looks like it’s going back down to the 83.00 major psychological handle after breaking above a descending channel. As you can see, the level lines up with the broken resistance level. Not only that, but it’s also near the 100 and 200 SMAs on the 4-hour time frame. 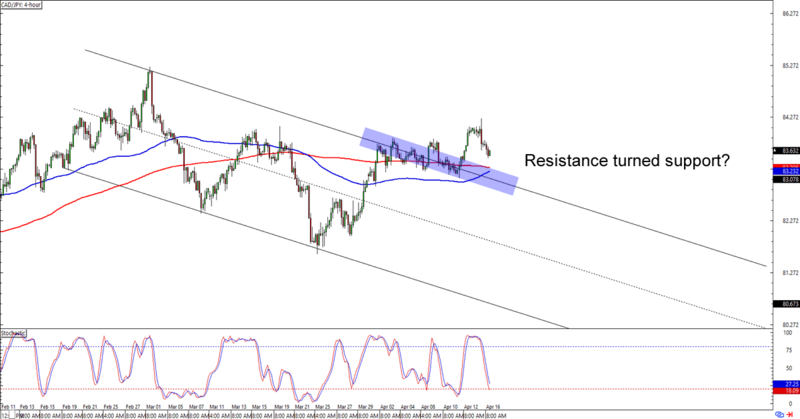 Is CAD/JPY about to bounce from the previous resistance? Or is the “breakout” actually a “fakeout” that will take the Loonie back to CAD/JPY’s downtrend? The pair hasn’t hit the 83.00 handle just yet, so there’s still time to write your trading plans if you’re planning on taking this setup. Buying at the earliest signs of a bounce is a good plan if you think that the Loonie will extend its bullish move against the yen. If you’re one of them Loonie bears, though, then you could also wait until the pair breaks below the SMAs and drops back to the descending channel before you place your short orders. Trend warriors huddle up! AUD/JPY is having trouble trading above the major 80.00 psychological handle, which isn’t surprising since it’s also just below a falling trend line AND the 200 SMA. What makes the setup more interesting is that AUD/JPY might be forming an evening star on the daily time frame. And with stochastic hanging out in the overbought region, you can bet that more than a few bears are already watching this one. Shorting at current levels would give you a good reward-to-risk ratio especially if the Aussie drops back down to its 77.50 previous support area. 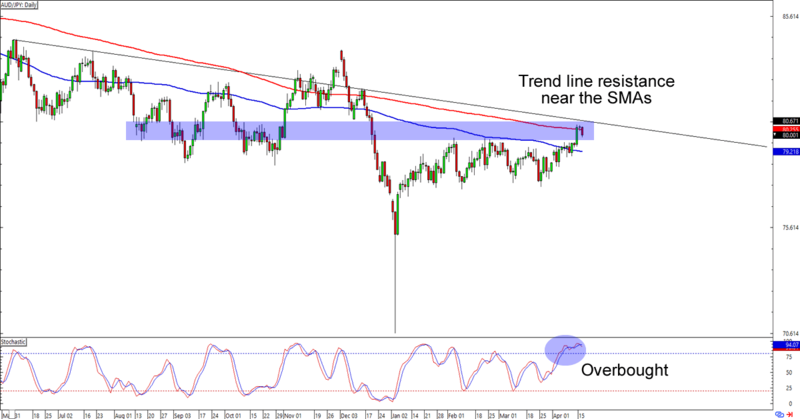 If you’d rather bet on an upside breakout, however, then you could also wait for AUD/JPY to pop above the trend line that we’ve identified. Whichever bias you’re trading this week, make sure you’re practicing good risk management, aight?